As the new kid on the MDO block, I have recently had the privilege to travel to the western areas of Central Queensland to meet groups caring for cultural heritage in the west. In a trip that covered Nebo, Clermont, Emerald, Springsure, Barcaldine, Muttaburra, Winton, Longreach, Ilfracombe and Isisford, I encountered everything from dinosaurs to diggers, as well as meeting the dedicated volunteers caring for these collections in the often hot and harsh outback. Daph Bashford’s 1976 rich boiled fruit cake at the Barcaldine and District Folk Museum. 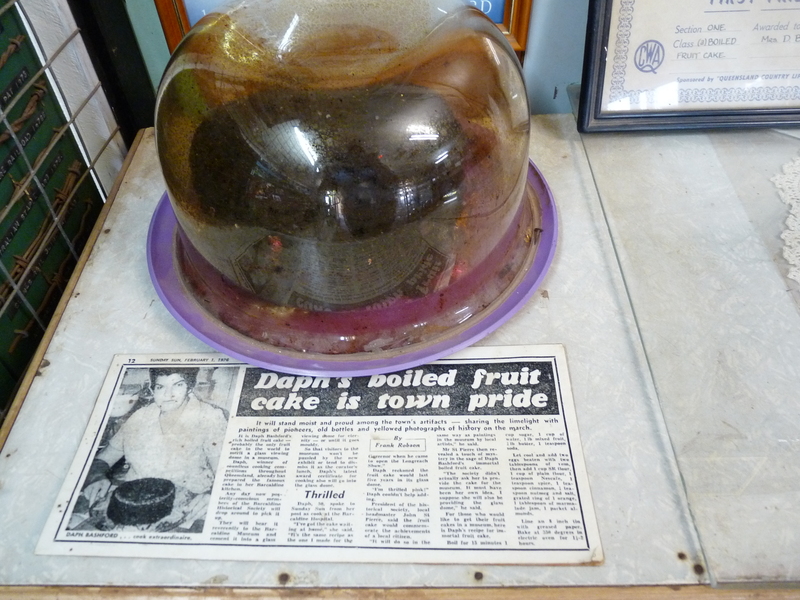 A new type of object for me was a 1976 prize winning rich boiled fruit cake, preserved in its own purpose built glass dome and proudly on display at the Barcaldine and District Folk Museum. It was originally intended that the cake would last about five years under its dome, but thirty eight years on the cake is still going strong, although the temptation to sample its rich fruity goodness isn’t hard to fight. Possibly most famous for its role in the 1891 shearer’s strike which ultimately led to the formation of the Australian Labor Party, Barcaldine has a rich agricultural and social history which is evident in the architecture and monuments about the town. Much of this history is eloquently told and on display at the Barcaldine and District Folk Museum. Aside from the fruit cake above and a wealth of social history items linked to the town, the museum also has an interesting collection of WWI material, including this pair of French airman’s goggles. 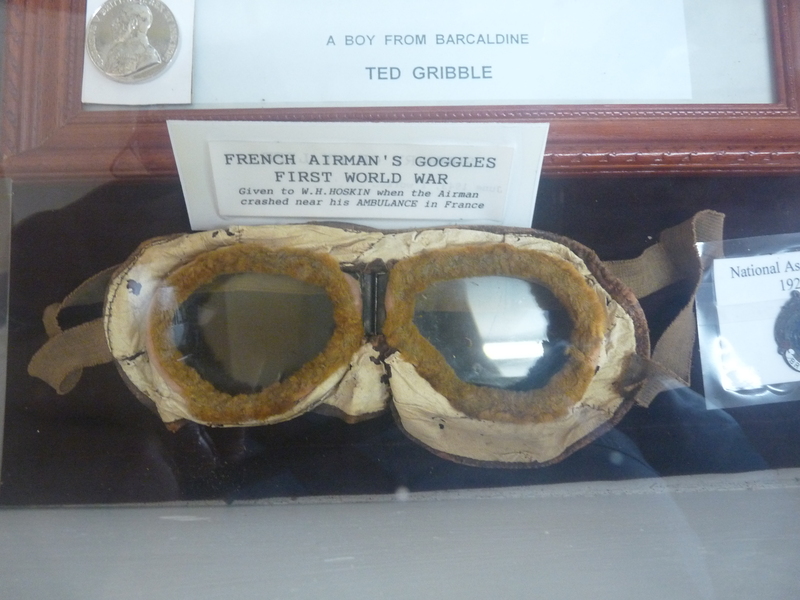 French airman’s goggles, brought back to Barcaldine by a local soldier. Also a central location in the 1891 shearer’s strike but now more famous for a major fossil find in the area in 1963, Muttaburra is a small town with a big history. When grazier Doug Langdon stumbled across some unusual looking rocks on his property, it led to the first recorded specimen of one of Australia’s prehistoric giants – Muttaburrasaurus langdoni – named for his discoverer. Affectionately known as ‘Mutt’ or ‘Dino’, the dinosaur is recreated in the park in the middle of town, and each year fossil enthusiasts visit the area in the hope of making the next big find. Muttaburra has more on offer than dinosaurs however, with the A.A. Cassimatis Store and Cottage and the Dr Arratta Hospital Museum capturing a snapshot of life in Muttaburra in a more prosperous time. 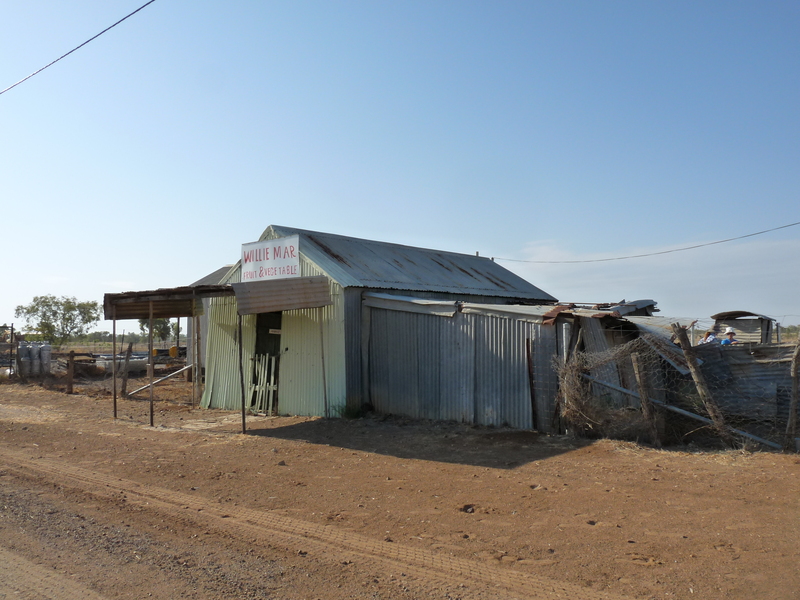 The range of goods on display at the Cassimatis Store helps to reinforce how essential these general stores were to remote communities, stocking everything from farm and stock supplies to boiled lollies and over the counter medicines. Dinosaurs were still on the menu in Winton, with a visit to the Australian Age of Dinosaurs. With a dedicated team of staff and volunteers constantly chipping away at fossil deposits, what’s on offer at the AAOD is continually evolving (unlike the dinosaurs themselves!). But as with Muttaburra, there’s so much more to Winton than dinosaurs. The heritage listed Corfield and Fitzmaurice Store not only has displays ranging from shearing to, yes, dinosaurs, but also offers a rare opportunity to see the virtually unaltered interior of an early 20th century general store, complete with manager’s office, clerk’s cubicle, and flying fox or cash railway for dispensing change. 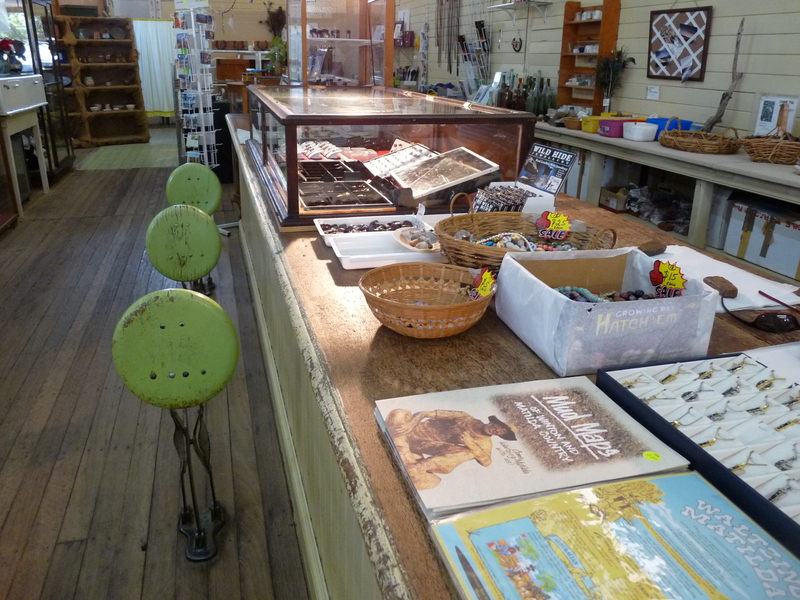 Folding stools and the beautiful broad planks of the haberdashery counter at Corfield & Fitzmaurice Store, Winton. Another rare survivor in Winton is the Chinese market garden and store of Willie Mar. The garden, which had provided Winton with fresh fruit and vegetables since the 1920s when Willie’s father commenced operations, only ceased to produce commercially in 2000 when floods impacted heavily on the aging Willie and his garden. Willie himself passed away in 2007, and many residents of Winton have vivid memories and engaging stories of Willie and his garden. Although the fruit and vegetables are gone, Willie’s shop and house remain at the site, as well as evidence of the ingenious pond watering system common to Chinese gardens. The Chinese skills and traditions of farming small patches of land with a continual crop yield became an essential part of community health and survival in many outback towns and the excellently interpreted Willie Mar site is a tangible reminder of this now extinct tradition. The progress on this site will be exciting to watch as the Friends of Willie Mar continue to interpret and share the site. A special thanks to the Friends of Willie Mar group and the volunteers at the Qantilda Museum for taking the time to share with us their wonderful collections. Willie Mar’s shop at the Chinese market garden site. Posted on 19 November 2014, in Melanie's Diary, Uncategorized and tagged Barcaldine, Central Queensland, Clermont, dinosaur, Emerald, Ifracombe, Isisford, Longreach, Muttaburra, Nebo, Springsure, Western Queensland, Winton. Bookmark the permalink. 2 Comments. Interesting and entertaining post Melanie, makes me want to visit the area again as I missed a lot of this history. Can’t wait for your next update!